I slept in this morning and missed my workout…I hate when I do that! It messes up my whole schedule. I didn’t have to be to work until later since we’ve been having some nasty weather so I made breakfast and ran some errands. Breakfast was delicious! 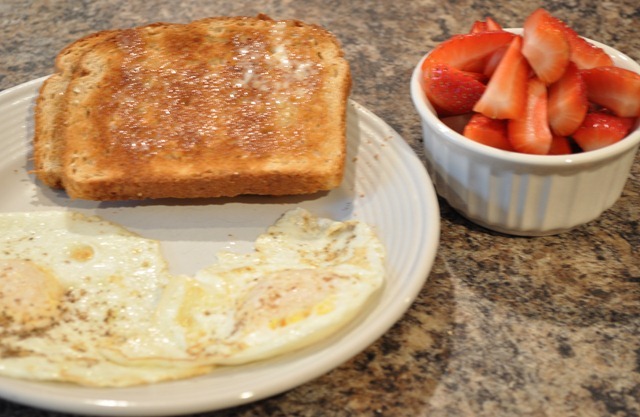 Two organic eggs, wheat toast, and strawberries! I usually try to eat fruit when it’s in season but strawberries were on sale this week and looked really yummy…not as good as freshly picked but still yummy! This held me over for a while! I didn’t grab anything to bring for lunch but I really didn’t get hungry until I was headed home…if I had worked out this morning I’m sure I would’ve been starving long before then! 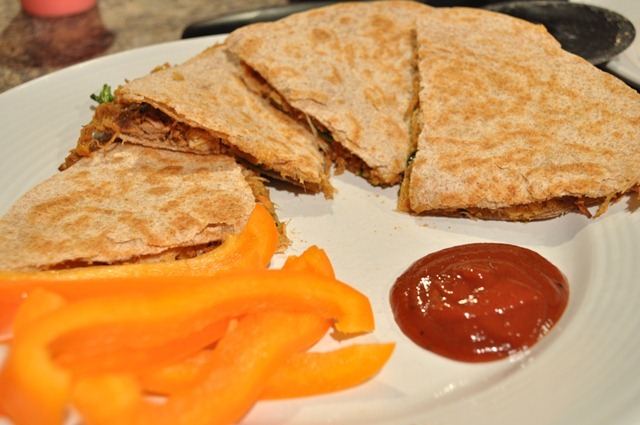 We decided on an early dinner and whipped together some quesadillas using leftover pulled pork (I froze it). 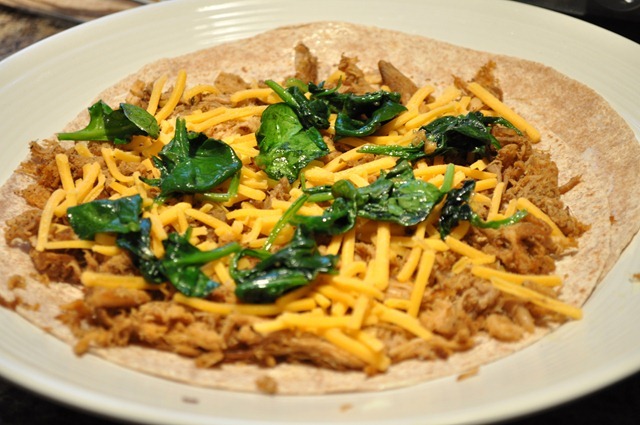 On whole wheat tortillas we piled pork, some sautéed spinach and cheddar…then grilled them on the griddle with some butter! With an orange bell pepper and barbeque sauce for dipping. A tasty way to use up leftovers! The Bachelor is on tonight! Woohoo! I’ll probably snack on some dark chocolate and maybe a yogurt if I get hungry post-yoga, which I’m sure I will. Good morning friends!! I hope you have a relaxing weekend ahead of you! 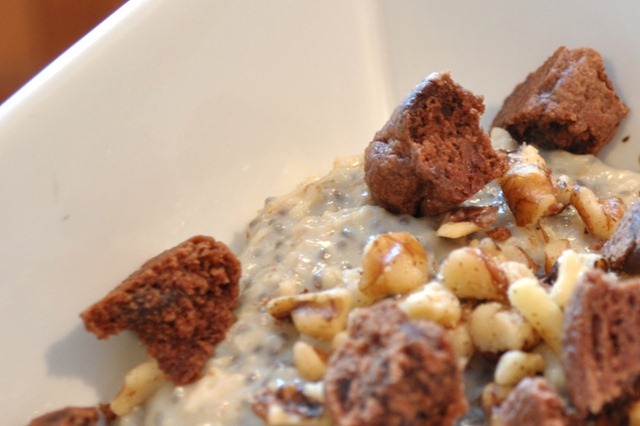 I woke up this morning with oats on the brain. I’m hooked! My oats were always lumpy and dry or thin and soupy in the past so finally cooking them right makes such a difference. I didn’t have any bananas so I had to do without today. It was missed! I love the creaminess it gives. It was like a brownie sundae! 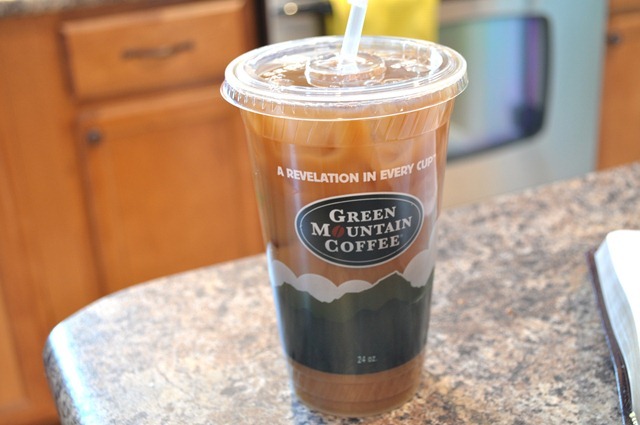 It was good but not as good as yesterdays’…I missed the peanut butter! For those of you that aren’t familiar with chia seeds, they are an excellent source of omega-3. One tablespoon contains over 2000 milligrams! 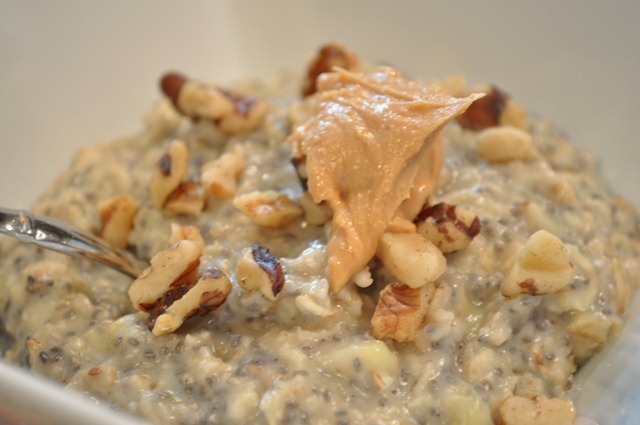 Chia seeds are also a great source of omega-6, protein, and fiber. I’m off to the grocery store! Not sure why I waited until the weekend since it’s sure to be crazy but I can’t put it off any longer!! I’ve been on a cookie kick lately (orange chocolate chip cookies, anyone?) 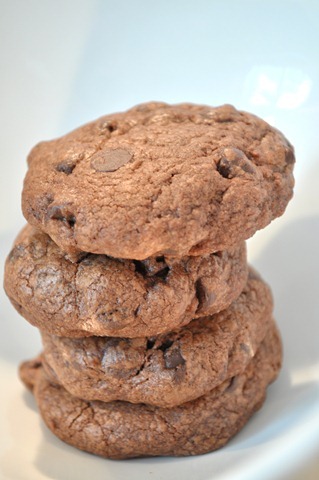 and I always love chocolate so I decided to whip up some chocolate cookies. 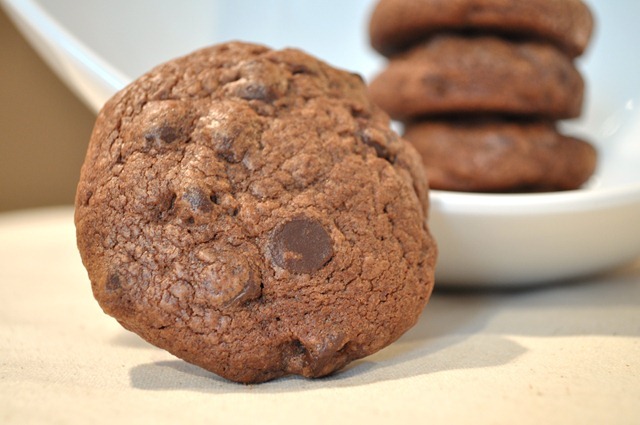 I don’t think I’d ever made chocolate cookies before, always sticking with traditional chocolate chip cookie recipes in the past, but after seeing these on Annie’s Eats, I have been dreaming of them since. 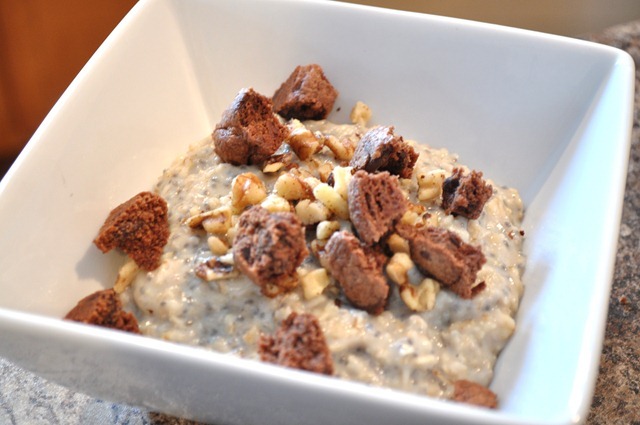 These are so delicious and definitely cure your chocolate cravings! I didn’t make giant ones but one of these smaller ones is plenty! They are so moist and chewy that I will definitely make them again! The cookie base would be great with many different mix-ins, like peanut butter chips, walnuts, toffee pieces, etc. Preheat oven to 350 degrees. Line baking sheets with parchment paper or silicone mats and set aside. In the bowl of a stand mixer fitted with the paddle attachment, beat together butter and sugar until fluffy, about 2-3 minutes. Add eggs one at a time, blending well and scraping the bowl down after each addition. Add the cocoa powder and mix well. Add the flour, salt and baking powder, mixing on low speed until just incorporated. Fold in chocolate chips. Scoop out dough using a medium scoop (mine were heaping). Roll into a ball and place on lined baking sheet, about 2 inches apart. Flatten slightly. Bake for 12-16 minutes, depending on the size of your cookies. Allow to cool for a few minutes on pans, then transfer to a wire rack to cool completely. A large glass of milk may be required. When I don’t measure up to much in this life, I’m a treasure in the arms of Christ! The fluffy stuff is falling from the sky again…but let’s focus on the fluffy stuff that is eaten out of a bowl! 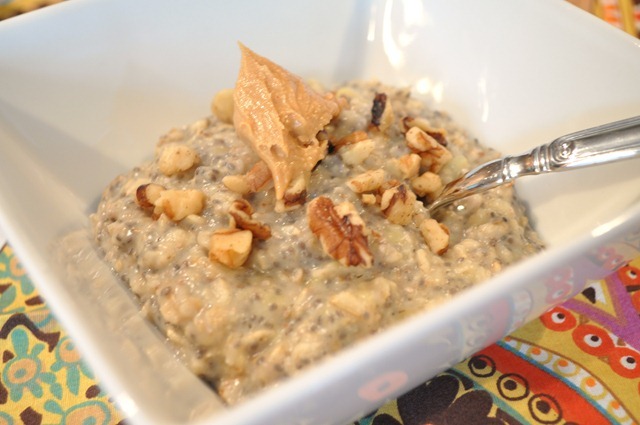 I added a sprinkling of walnuts and about a teaspoon of white chocolate peanut butter. I’ve had this stuff sitting around since last summer and have been on a little kick lately, eating it on my pre-workout slice of bread. It’s delicious! 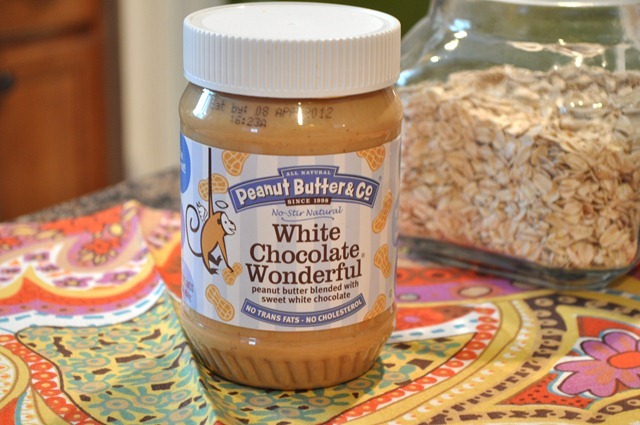 I am more of an almond butter eater but I love the slight sweetness the white chocolate gives this. Yum! I got my workout in before breakfast with the P90X Shoulders and Arms DVD and Ab Ripper. Today concludes Week Two! Only eleven more to go…I’m looking forward to them! I really like the program so far and feel like I’m truly getting an adequate workout with each one. They are longer than other exercise DVDs that I’ve done but I feel like I need the extra time to push myself. They are tough and I still can’t complete all of them straight through but I’m working up to it! Having a group of friends to do it with has been so helpful for getting through it each day and getting up to do it each morning. We keep each other accountable and push and encourage one another. It makes it so much more enjoyable! Even though we are only on the third week I feel like I’m stronger than I was in the beginning and starting to see a bit (if only a tiny bit :)) more definition in my arms and abs. We’ll be taking progress photos sometime in the next few weeks so we’ll see then!